Everything in me tells me to stay away from this car. First of all, I don't like the color. (Nor do some of my friends... 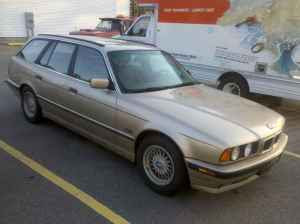 Quoting from a friend's text "A gold BMW wagon? Be forewarned, I'll make fun of you a lot if you buy that!") Secondly, to the best of my knowledge, BMW did not export any AWD E34 5 Series wagons to the US. I doubt this is a gray market car and I'm a little leery of buying a car from someone who knows so little about it. Thirdly, the seller DOESN'T RETURN CALLS. She (Suzi) leaves 3 numbers. I've called them and left messages (and the voicemail greetings sound nothing like any "Suzi" I've ever met. - This one may have a hormonal problem), but have not gotten a call back. WTF? If it's sold, stop reposting it on Craigslist. The E34 was, in my opinion, the first really great 5 Series. Introduced in 1989, this was the second car to feature BMWs then new rounder styling. (The first, the E32 7 Series was introduced in 1987, the last, the E36 3 Series in 1992.) From the get-go it won acclaim from the automotive press. Built until 1996, it is a car that was known for its reliability and durability. As is typical of BMW, there were many versions and engines available. Here in the US we received the 525i, 525i Touring (like this one), 535i, 530i(I6), 530i(V8) Touring, 540i, and the M5. In Europe they got about a half-a-dozen more. What's truly remarkable about these cars is how little goes wrong with them. The early 3.0 and 4.0 liter V8s were made of Nikasil, which caused some problems. BMW simply extended the warranty on those cars and replaced the engines if they failed. Problem solved. The I6 engines (2.5, 3.0, 3.5) didn't have that problem and might be some of the most durable engines ever to find their way into a performance car. The interior, which is sparse by luxury car standards, holds up well, as do all the controls and switches. 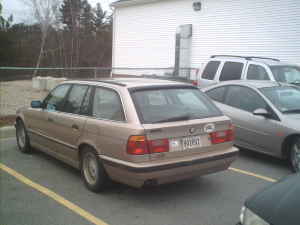 Older cars are prone to rust, but I've seen many rust free high mileage E34s, even here in New England. If the car was washed regularly the bodies can last as long as the drivetrain. WHICH IS WHY I WANT TO LOOK AT THIS ONE! It's not AWD, but it has the cargo capacity I need. Very few E34 Tourings were sold in the US. This is a rare find and a car I would own despite the color (and my friend's jokes). Located (maybe) in Rochester, NH, click here to see the Craigslist ad. Nice to see its 'ALL THERES', I hate when you purchase a car and its not all there and inspections are so 'PASSE'. Nice to see you can call her 24/7, try her at 2AM.